West Cork Heritage Centre, Bandon is housed in the former Christchurch on North Main Street Bandon. Christchurch dates back to circa 1610 and is built on the site of a Danish Fort. It was one of the earliest Protestant churches in Ireland and was a church for 363 years. It was deconsecrated in 1973. A portion of the old Bandon walls are also part of the structure of the building. Some Bandon church records are held at the Centre to help people trace their families. This beautiful building needs to be maintained and preserved. 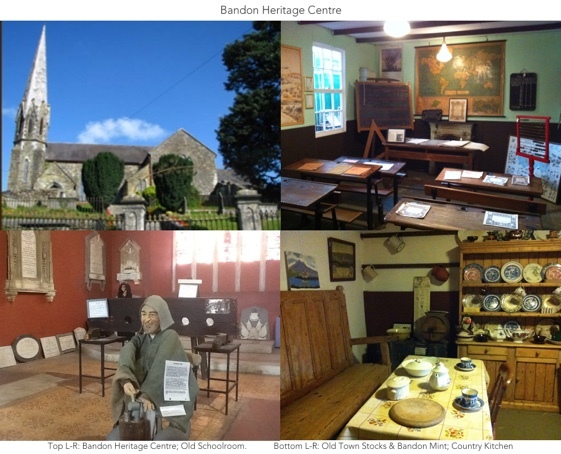 Currently, in an effort to raise funds to keep the building going, a team of volunteers run a heritage centre with the theme of Bandon’s history. Visitors can see replicas of an old shop, school, kitchen and forge. The current exhibition also includes the old town stocks and memorabilia from Bandon’s time as a garrison town. We also help people to find their roots by going through the Bandon church records on site with them. If we had the funds to add a stair rail to the outside steps, install some kind of internal heating system and repair the hole in the roof we could extend the use of this building as a public space for exhibitions, readings, small recitals, movie screenings, theatre productions and more. All government grants require matched or at least partial funding before they will assist with conservation so this is why we need to fundraise at this time. In turn we hope this could generate more revenue for the building and so that in time it could become self-sustaining. If everyone with some connection to Bandon or West Cork could just give us the price of just one cup of coffee we could do this! Please help us to create a great space for the Bandon of the present and the future.